IF an assessment asks students to EVALUATE and CREATE but or instruction asks only that they remember, comprehend, THEN we've taken a wrong direction. 8 questions from the SBAC practice test were used as the pre-test in my research study on the effects of developing critical thinking skills on standardized test performance. By developing student metacognitive thinking skills, the study hoped to discover whether students would become better critical thinkers and thus gain mastery of the content, using standardized tests as the test measure. The 8 questions were strategically chosen to represent a wide range of concepts and depth of knowledge within a small unit of the 8th grade mathematics curriculum in order to asses content mastery and the use of critical thinking skills to problem-solve higher order mathematical problems. For those who do not have the time to create their own assessments or have others vet it, visit the SBAC website, here, in order to access a wide range of practice tests and performance tasks for your grade level and your desired concepts. They also include ready-made rubrics and scoring guides! Also, check out the practice test and scoring guide I used in my research and the results I obtained down below. SCROLL or download the full documents here. 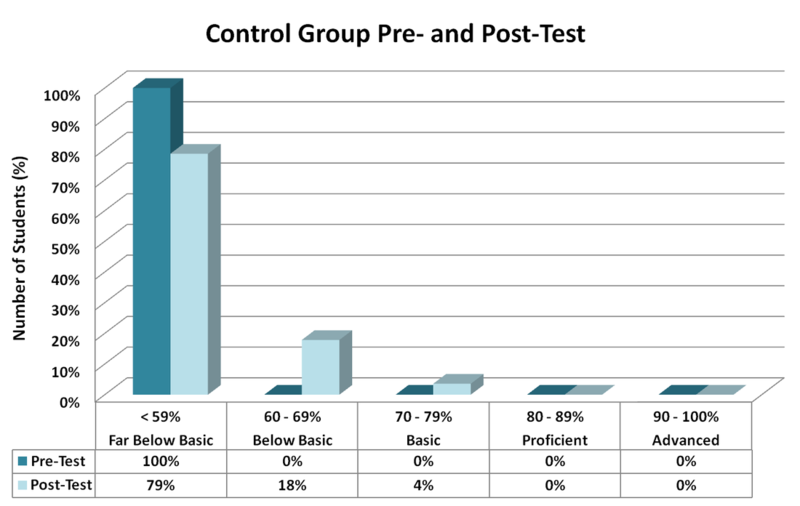 Results: Based on the data, 100% of the treatment group and control group performed far below basic on the pre-test as seen in the graphs. 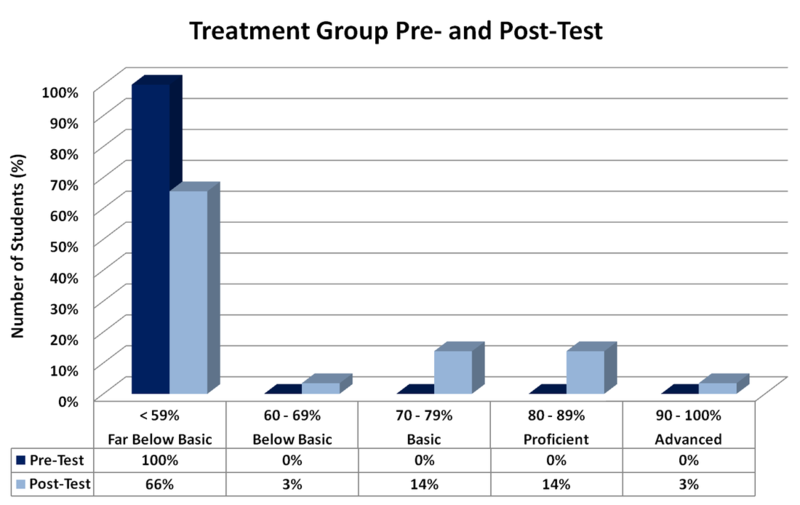 However after a two week treatment using metacognitive scaffolding techniques, the average scores of the treatment group went from 2.6 to 5.44 points as seen in the data tables above, demonstrating an overall improvement of 109% based on the post-test scores. After two weeks of traditional instruction, the average post-test scores also improved by 27% which is only a fourth of the treatment group's improvement. A paired t-test (or repeated measures test) was conducted and both showed extremely statistically significant difference between the pre- and post-test scores with p-values less than 0.0001. Furthermore, between the two groups, using an independent measures test, there was also an extremely statistically significant difference suggesting that the treatment contributed to the difference. Explore the assessments, rubrics, and scoring guides I used in my research down below to see how you can possibly apply them in your own class! This is a Math 8 performance task that I designed to support the development of critical thinking and the 8 mathematical practices by using an engaging rigorous and authentic task. During this performance task, students used a metacognitive scaffolding journal which can be found, here, or in my lessons page. This was used in the third lesson (4-day lesson) of a lesson series in developing metacognitive thinking skills. This is better used after students have been exposed to the content of linear equations and systems of linear equations. Use explicit instruction to teach how to think through problems like these using various examples, contexts, and strategies. I would also suggest giving students a similar problem at a lower level to complete in pairs or groups to allow them to build their confidence. There is a general scoring rubric provided by SBAC for your use in assessing your students' knowledge and skills. Choose from a 4, 3, 2, or 1-point rubric to fit your needs. This is a Math 7 performance task that I adapted from an SBAC practice performance task. This was the second lesson of a lesson series used to introduce my students to a new perspective of thinking during problem-solving. Full lessons can be found on the lessons page of this website. Prior to this performance task, students learned about metacognitive thinking skills and why they were important. During this performance task, students were introduced to a metacognitive scaffolding journal template which was basically a highly scaffolded graphic organizer with guiding questions to help them think through the question, make connections with prior knowledge, monitor, and reflect on their problem-solving process. The template can be found, here, or in my lessons page. There is a general scoring guide provided for you use. This was a great way to ease my students into learning how to use metacognitive thinking skills because I used a task that was a grade level below. It helped students focus on the thinking strategies rather than how overwhelming the concepts were. The first two documents are 4-point rubrics I during a student Socratic Seminar in the last lesson of a lesson series on developing metacognitive thinking skills. These rubrics can be used to evaluate student critical thinking performance and their skills during the discussion. Be sure to go over the rubric with students and provide clear expectations. It is also suggested that a smaller fishbowl activity is conducted to model the kind of behavior and interaction you wish to see from your students. Another idea is to have students work in teams to discuss a different topic (can be math related or not) to get practice and build their confidence. Next, teach your students to self-evaluate, reflect, and monitor their goals using the self-assessment worksheet provided below. Go over the skills and kind of participation you expect from your students during the Socratic Seminar discussion. Explicitly model to students before having them complete the self-assessments so they know concretely what they are looking for then have them come up with a goal to improve. Last, use an evaluation checklist to document the discussion and provide your students with constructive feedback to let them know how they can improve. SCROLL or download the full sized documents here.